Don't like it? Just cancel before the end of the 30 day trial period. Your credit card will not be charged until your 30 Day Free Trial has ended. You can cancel anytime during your trial with one easy click. We'll send you a reminder email the day before your Trial ends. Why are we asking for this now? Ready to work out on your own schedule? 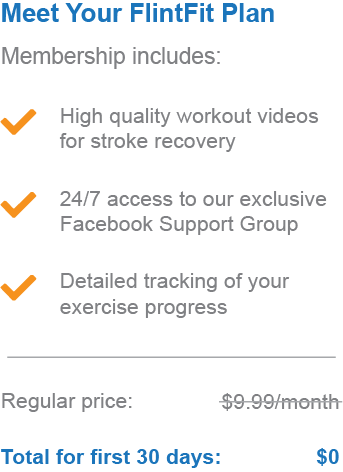 FlintFit is an exercise program that lets you schedule stroke exercise videos for the hands, arms, core, and legs. Simply click on the video you would like to watch and follow along with licensed physical and occupational therapists. You can track your progress and set goals for each day. Check out the video to see what FlintFit is all about. Want to see how it works? Watch this instructional video to see a step-by-step walkthrough of the FlintFit program.